Prefere de nos Montagnes is a pasteurized cow’s milk cheese from the Jura region of France. The name translates to “favorite from our mountains”. 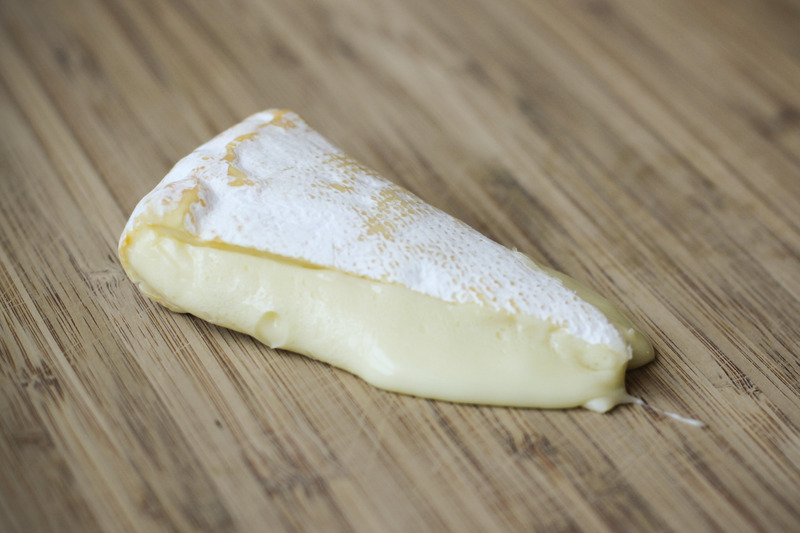 The cheese is a semi-soft washed-rind variety, very similar to a Reblochon. As you can see from the photo above, it has a creamy, oozy texture, which just coats your tongue with silky goodness. I bought this small piece of cheese today at Formaggio Essex for $2.00. See… buying specialty cheese doesn’t have to be a burden on your wallet! I walked into the little shop and told the cheesemonger (aka – cheese seller) that I wanted to try something French and delicious! I saw a Camembert in the front of the case that looked delightful, but I had just had Camembert earlier this week and I wanted to try something new. She recommended this little beauty. When whole, it comes in the shape of a round disk – about the size of a saucer and it is about three-quarters of an inch thick. The pale orange color of this cheese is typical of washed-rind cheeses. This family of cheeses are called “washed-rind” because they are washed with some sort of solution during the ripening process – wine, salt water, brandy, spirits and beer (often made in the same region as the cheese) are common solutions used to wash the cheeses. This process helps to ripen the cheese by encouraging the growth of good bacteria. If you’re not familiar, the washed-rind cheeses are the ones that are known to be the real stinkers! When I did my internship in the caves at Murray’s, cave number five was the place for the washed-rind cheeses. At first, the smell was overwhelming, but oddly enough – I grew to totally love that smell. I’d be closed up in the cave for hours washing hundreds of cheeses and when I’d leave the store and enter the real world again, I’d smell myself the whole way home! Ahhhh – stinky cheese. This cheese, however is only mildly stinky for a washed-rind cheese. As for the overall taste experience … I find it to be slightly salty, slightly floral and pretty simple and yummy. The flavors are not all that complex… although the floral taste does linger in my mouth nicely. And I LOVE the texture. It is ultra creamy and sumptuous. As I’m sitting at my computer, taking bites (its almost gone), I’m craving a nice light fruity red wine to complete this little yum fest. I need to develop a rating system of sorts – but since I don’t have one yet, I’ll say this… I like this cheese, it’s very nice – but it doesn’t blow my mind. If you’re just starting to experiment with washed-rind cheeses though – this cheese might be a good place to start. I personally – like them a little bit funkier myself.